In earlier times in Daha kingdom there lived a Brahmin who benama very famous Sidi Mantra miracle . Trance Guru rewarded Widya or property and a beautiful wife . After many years of marriage , they had a son who they named Manik Angkeran . Although Manik Angkeran a handsome and intelligent young man but he had a poor trait , which is like gambling . He often risked losing so he had his parents' property , even in debt to someone else . Because it can not pay debts , Manik Angkeran father asked for help to do something . Sidi Mantra fasted and prayed to the gods for help . Suddenly he heard a voice , "Hi , Sidi Mantra , in the crater of Mount Agung there are guarded treasure dragon dragon name Besukih . Go there and ask that he wants give little treasure . " Sidi Mantra go to Mount Agung to overcome all obstacles . Arriving at the edge of the crater of Mount Agung , he sat cross-legged . He rang the bell while reciting mantras and call on the name Dragon Besukih . Not long then utilized the dragon out . After hearing intentions Sidi Mantra , Dragon Besukih squirm and scales out of gold and diamonds . After saying thank you , Sidi Mantra excused himself . All property that gets given to Manik Angkeran the hope he will not gamble anymore . Of course not long after , the treasure was gone for a bet . Manik Angkeran once again enlist the help of his father . Sidi Mantra of course refused to help his child . Manik Angkeran heard from a friend that the property was obtained from Mount Agung . Manik Angkeran know to get there he had to cast a spell , but he never learned about prayer and mantra . So , he just took the bell that was stolen from his father when his father sleep . After arriving at the crater of Mount Agung , Manik Angkeran gentanya ring . He is not playing scared when he saw the Dragon Besukih . 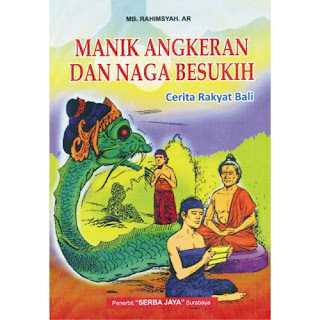 After hearing intentions Manik Dragon Angkeran , he said , " I will give you treasures that you ask , but you have to promise to change your behavior . Do not gamble anymore . Remember the law of karma . "